For most wine buyers, the ever changing classification of St. Emilion wines is hard to keep track of, and even more difficult to follow or understand. Similar to Abbot and Costello with “Who’s on First”, it can seem difficult to tell the players without a program. Truthfully, it’s not too bad, once you get the hang of it. This page on the Saint Emilion Premier Grand Cru Classe B wines will help make it easy to understand. The original 1855 Classification of the Medoc remains a fixed document recognized by the French Government and Bordeaux buying consumers all over the world. After more than 160 years, it’s still in place. The classification system in Saint Emilion was designed to be radically different starting with the fact that the wines are reclassified every ten years in St. Emilion. In 1955, when the chateau owners and negociants created the original classification of their wines, it was agreed that it would be best to keep the classification current. The best way to accomplish that was to renew the classification every decade, give or take. In reality, the ever changing parade of who’s on first does more harm than good to many consumers. In today’s world, it’s an anachronism. Wine prices are set by the market, not by the level of classification. Wine buyers are generally speaking, savvy and well informed. With the advent of the Internet, they are better informed today than at any time in the past. The price the markets pay is the only true classification needed for most wine buyers. That is, unless you are from France, where classifying things is second nature. The links on the left side of the page bring you to full, detailed profiles on the St. Emilion Grand Cru Classe B wines which feature wine tasting notes, images, histories, information on wine making, terroir and more. The best way to look at the St Emilion Premier Grand Cru Classe B level of classification is, think of it as the equivalent of a First Growth property in the Right Bank. As a point of reference, when compared to the Left Bank classification, they are more in line with the Second Growths, or Super Second wines. When you move up in the Classification in the Medoc, or in Saint Emilion, there is supposed to be a big difference between Saint Emilion Premier Cru Classe B wines with wines classed as Premier Grand Cru Classe A wines in price, terroir, quality and reputation. The prices asked for each of those levels of classification, bears that out. Perforce, there is an equal difference in price when compared with the majority of Grand Cru Classe wines. In the most recent St. Emilion classification from September 2012, only 14 chateaux earned the coveted level of St Emilion Premier Grand Cru Classe B status. In the previous classification from 2006, there were 13 estates classed as First Growths. 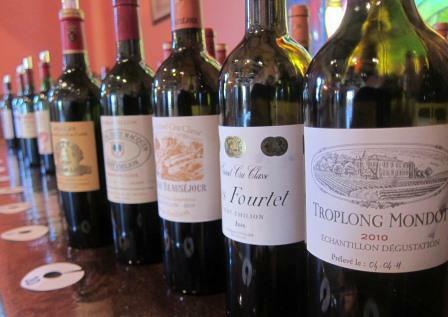 In 2006, Chateau Troplong Mondot and Chateau Pavie Macquin were deservedly promoted into the club. The numbers alone do not paint the full picture. La Mondotte, Valandraud and Chateau Canon La Gaffeliere were promoted to the exclusive club in 2012. Chateau Magdelaine was merged out of the category into Chateau Bel-Air Monange. Rumors were, the property was going to be demoted for a lack of quality and selling price. Ets. Moueix denied those claims saying it was a personal choice. I’ll leave it to you to decide on that one. The most controversial changes to the St Emilion Premier Grand Cru Classe B classification in the eyes of some consumers and especially with the two estates who have held the level of Premier Grand Cru Classe A status since the classification was created, was the promotion of Chateau Angelus and Chateau Pavie to the same level held by Chateau Cheval Blanc and Chateau Ausone. Consumers are a fickle lot. In 20 years, my guess is, they will never remember a time when Pavie and Angelus were not St Emilion Premier Grand Cru Classe A chateau. There were a few other, interesting surprises to the 2012 St. Emilion Classification. La Mondotte and Valandraud jumped from Grand Cru status to Premier Grand Cru Classe B! That has not happened before. With the exception of the initial 1955 classification, all chateaux moved from Grand Cru Classe to Premier Grand Cru Classe status. La Mondotte and Valandraud deserve their current level of classification. The wines are outstanding, commanding high prices from collectors. It’s important to understand that there are a few other properties making sublime wine that also deserve to be in this rarified club. For example, Tertre Roteboeuf. However, as they prefer marching to the beat of their own drummer, they are not willing to apply for the classification, so the point is moot. The biggest change in St. Emilion, due to the classification of 2012 is that the Premier Grand Cru Classe chateaux no longer function as a group to promote the wines of St. Emilion. This is due to arguments between producers with both Premier Grand Cru Classe A and Premier Grand Cru Classe B status. It’s as complicated as it is sad. The 2012 St. Emilion classification included Premier Grand Cru Classe A, Premier Grand Cru Classe B and Grand Cru Classe wines. In the first classification of St. Emilion, 12 chateau were considered worthy of St. Emilion Premier Grand Cru Classe B status. That number has remained relatively constant, as only 14 estates were classed as St. Emilion Premier B in 2012. To achieve the level of St. Emilion Premier Grand Cru Classe B status, the properties needed to score a minimum of 16 out of 20 points using the following criteria. The wineries were required to provide samples of the previous 15 vintages for blind tastings. Chateaux were judged on more than their wines. Numerous other factors were also considered. For example, for estates seeking Premier Grand Cru Classe status, the wines were only 30% of their total score. Chateau were also looked at on the basis of their image and reputation in the world marketplace which was 35% of their final score. Terroir and soil were also factors accounting for 30% of their score. The commercial practices of the property were looked at as well making up the remaining 5% of the score. Even with such a small, exclusive group of wines like these, there are wide variances in quality between the wines. There are also major differences in prices paid for each wine. Regardless of what a body in France tells consumers what the best wines are, consumers know and they cast their powerful votes with their wallet. At least in my view, that is the only true classification. The best part of the marketplace classification is, it won’t take a panel of experts or a court order to change it, the market will set the price based on what it wants to pay.